Bio-Microbics, Inc. has expanded its stormwater treatment line with the d-Rain Joint Exterior Linear Drain Filter Expansion Joint designed for onsite rainwater management. Bio-Microbics, Inc. manufactures innovative, economical and practical solutions, and products that solve onsite water concerns to achieve energy efficiency, and green practices. Developed originally by Bryan White of Arvis Eco to satisfy permeable, pervious driveway requirements in Indiana, the d-Rain Joint uses the low-cost concrete medium that the homeowner wanted and started offering d-Rain Joint to his other high-end code developments as an alternative to expensive pavers. Urban storm water runoff has become a focus in recent years. In most cities, significant amounts of water fall onto impervious surfaces, such as roads, driveways, parking lots, etc., ending up as run‑off; sheeting across surfaces and picking up more contaminants and pollutants to simply flow out unfiltered to waterways through the storm drains and greatly reduces the amount of water infiltrating the soil. The d-Rain Joint is a simple, low-cost, and robust onsite storm water management alternative compared to other permeable, pervious surface options and can be used wherever a permeable, pervious driveway, parking lot, street or walkway is needed. The d-Rain Joint system is a highly effective and unique design that allows the use of traditional concrete, asphalt or paver type materials to construct a high performing permeable, pervious surface system. Easy to install like a standard expansion joint in a driveway or walkway, the ADA-compliant d-Rain Joint drainage channel system is less than an inch (1”) wide and is virtually undetectable between the joints of a concrete slab. 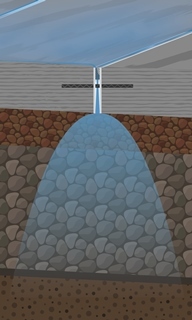 The product is highly durable material and gives storm water a path to a sub-surface drainage bed; this provides an outlet for surface water to be directed to a drainage bed and collected and held or allowed to percolate back into the soil to conform to environmental conservation and protection requirements. The channel-inserted filter captures sediment to ensure continued effectiveness of the system. The d-Rain Joint uses rebar (standard steel, uncoated/coated, galvanized, synthetic, or sleeved with heat shrink tubing) through predrilled holes in the product to stabilize and “connect” the d-Rain Joint with poured-in-place 4” concrete slab. The d-Rain Joint is placed on a 4” bed of pea-sized gravel, which is on a 1’ aggregate gravel bed. The d-Rain Joint drainage channels do not extend all the way to the side concrete forms this is so that the channel will become a completely enclosed channel after the concrete has set. The drain, which offers a flow rate of more than 2 gallons per minute per linear foot, installs at the same time as the surface installation. The d-Rain Joint is a new, innovative and cost effective method for creating permeable, pervious surfaces where LID (low impact development) stormwater management is needed.